Helping the environment can have a positive impact on your bottom line. Recycled materials have a positive effect on the environment as they help to prevent more waste from being generated and reduce the consumption and use of new materials. As outlined in our previous post, Recycling 101, a number of common construction materials are recycled, repurposed, and reused today. Construction waste is becoming a global problem. For instance, in Malaysia the construction industry generates such a large amount of waste that it’s having a significant negative impact on the local communities and environment. Unfortunately, this is becoming the norm in much of the world. Most big cities in the world are having these same issues of environmental pollution and community degradation. Recycling and reusing construction materials causes the negative impacts of the building process to greatly diminish. The other good news is that recycling and reusing materials has a positive impact on the bottom line of your business by cutting waste and subsequently costs. If you are able to reuse materials from site to site, you won’t have to spend as much on materials. Also, the cost of purchasing recycled materials is usually less than buying new. As people become more aware of environmental issues, the demand will increasing for buying homes and commercial buildings composed of recycled materials. By incorporating recycling into your own construction projects, your company will be set up for increased efficiency and success in the future. The impacts of recycling extend well beyond your local construction site. Below, you’ll see just how far your impact extends. The manufacturing process of construction materials is a huge generator of air pollution. 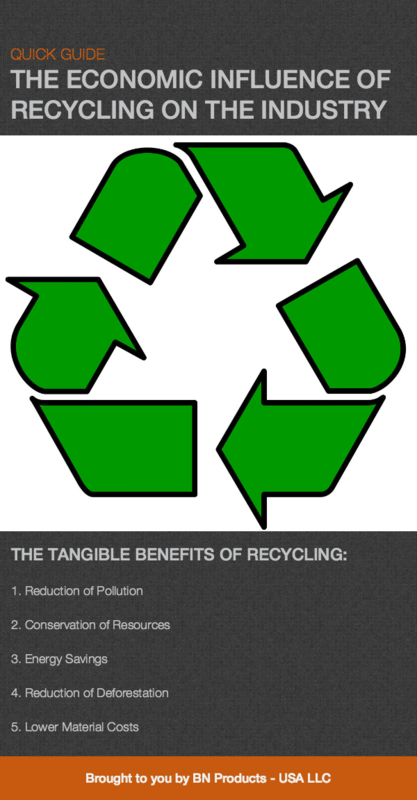 Hence, when materials are recycled and reused there is less of a need to manufacture new materials. Recycling also helps to reduce the pollution that occurs from coal burning power plants to power the manufacturing process. Earth has a finite amount of resources. So, the more we extract during our lifetime the less we end up leaving for other generations. Recycling construction waste helps to get the full use of the materials we’ve already extracted, and helps reduce the need to constantly extract more. It takes much less energy to make products from recycled materials than it does to make them from raw materials. When products are made from raw materials, energy is used in the extraction process and the manufacturing process, versus just the manufacturing process. It is also much easier to break down recycled materials into their core components. Almost every recycling process helps to achieve significant energy savings. Recycling helps to reduce the need for raw materials, so that forests can be conserved. Wood is used for many parts of the construction process, so reducing the need to cut down more trees will greatly help preserve the health of the forests. What Is The Overall Impact Of The Construction Industry and Recycling? The construction industry uses roughly 13,000 feet of lumber for framing alone in every new home. Over 85 millions tons of material are recycled in the U.S.A every year. Over 8,000 pounds of waste are created from a 2,000 square foot home during construction. 50% of the steel that has been produced in the US every single year has been recycled. A steel mill can reduce water pollution, air pollution and waste by 70% by simple using recycled scraps. Advances have been made in the construction and recycling industries in recent decades that have helped to decrease the bottom line of construction companies and help to create a positive impact on the environment. Truthfully, that is an important aspect of recycling to bear in mind. Recycling and green building technology, as outlined in this previous article, are about more than just consideration for the health of the environment. They are, at their core, about improving the construction industry’s efficiency in order to reduce waste and cut costs for your projects and your company. These principles are no different than why you purchase quality professional construction tools, such as the BNT-64 Rebar Tying Tool, which reduces both rebar waste and increases workplace productivity by preventing wire waste and shortening tying time. In the spirit of recycling, we also carry a number of refurbished and demo construction tools for direct sale, and have helpful tips on recovering and recycling rebar.